Chulu Far East Peak Climbing is one of the easiest and the outstanding peak climbing in Nepal. The Chulu Peak is located in the northern part of Marsyangdi Khola in the Manang region with the elevation of 6059 m. This peak was first climbed on 1955 by the German expedition. 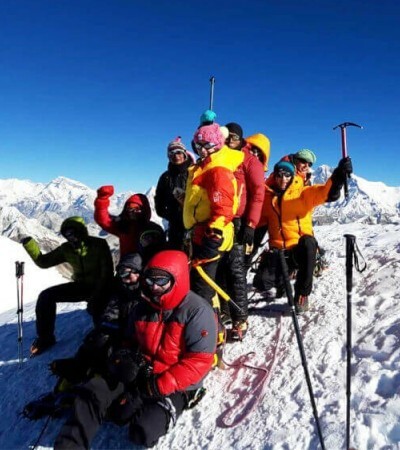 The Chulu Far East Peak Climbing takes you on top of the Chulu Far East Peak which offers the most gorgeous views of snowcapped mountains and the towering peaks. Basically, the trekking to Chulu Far East begins after almost 6 -7 hours of driving to Chame. Then your trekking embarks on along the Pisang Peak trekking routes at first. On the way, you pass the lots of beautiful ethnic villages with full of awe inspiring cultures. The trek goes ahead by passing the terraced farming land, white waters, hilly gorges and the waterfalls. These all are very remarkable. After having a rest for acclimatization in Base Camp of Chulu Far East Peak, you move up to the High Camp and only then your climbing starts with full of technical safety and security. Once you reach on top of Chulu Peak, you forget all the difficulties that you have tolerated during the trekking and climbing and immerse fully into the views of surrounding peaks like Annapurna ranges, Pisang Peak, Chulu West Peak, Himlung Valley and other towering peaks. After spending some times over there by clicking the pictures, you descend down. Then you join the Annapurna Circuit Trekking route. The Thorong Pass is the highest point of this trekking which is the popular route of Annapurna Circuit Trek. It also offers the breathtaking sceneries of Himalayan giants. Muktinath Temple is another attraction of the trekking. Rising Adventure has the years of experience in the fields of peak climbing. For more about the Chulu Far East Peak Climbing, you can contact us at any time. Day 03 :Drive to Chame (2660 m). 6-7 hrs drive. Day 04 :Trek to Pisang (3300 m). 5-6 hrs trek. Day 05 :Trek to Humde Gaun (3330 m). 3-4 hrs trek. Day 06 :Trek to Julu Khola (3500 m). 3-4 hrs trek. Day 07 :Trek to the chulu Far East Base Camp (5000 m). 5-6 hrs trek. Day 08 :Acclimatization day at the Base Camp (5000 m). Day 09 :Trek to Chulu Far East Peak High Camp (5500 m). 3-4 hrs trek. Day 10 :Climb to the Chulu Far East Peak (6059 m) and come back to the Base Camp (5000 m). 8-9 hrs trek. Day 11 :Trek to the Manang Village (3540 m). 5-6 hrs trek. Day 12 :Trek to Yak Kharka (4050 m). 5-6 hrs trek. Day 13 :Trek to Thorang Phedi (4450 m). 5-6 hrs trek. Day 14 :Trek to Muktinath (3760 m) through Thorong La Pass (5416 m). 8-9 trek. Day 15 :Trek to Jomsom (2730 m). 5-6 hrs trek. Day 16 :Flight to Pokhara (820 m) and Pokhara Sightseeing. Day 17 :Drive back to Kathmandu (1350 m). 6 hrs trek.